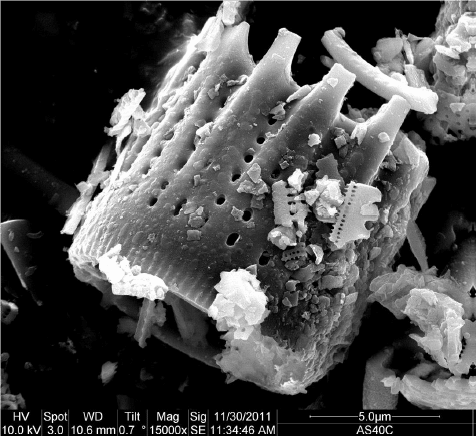 Photo micrograph of Melosira diatom from Basalt. The Dicalite Company prospered in the 1920’s, and in 1934 additional mining claims were being staked at Basalt, Nevada. In 1945 the Dicalite Company purchased the mining claims in Basalt, Nevada from the United States Diatom Company. 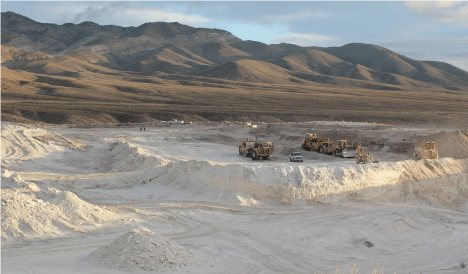 Currently the Basalt, Nevada diatomite plant is owned and operated by Dicalite Management Group, and is the fourth oldest continually operated mine in the state of Nevada. The Basalt mine is located in the Mina Deflection or southern portion of the Walker Lane Belt; a belt characterized by shear faulting. The Basin and Range mountains of Nevada formed as a result of extensional stresses of the earth’s tectonic plates. The north-south trending mountains and valleys of this province were formed by normal faulting to compensate for the stretching of the crust. This mountain-building resulted in a thinner crust and an upwelling of the mantle. This, in turn, allowed the extrusion of basalt and andesite in the region. About 5 million years ago, it was upon these volcanic formations that an isolated lake bed developed and diatoms flourished. In this lake ideal conditions occurred that allowed for the proliferation and accumulation of the pure diatomite beds of the Basalt deposit. Diatomite probably accumulated at a rate of about one foot per 1,200 years so the deposit developed over a 100,000 to 200,000-year period. As the tectonics of the area changed from extensional to shear; the Mina deflection began experiencing east-west strike-slip faulting. Along the southern edge of the deposit, the east-west Coaldale fault developed. This fault has actually displaced to the east some of the southern edge of the deposit. Beginning about 3M years ago this fault system has had a cumulative displacement of about 1 Km. Diatomite itself is made up of microscopic fossil plants skeletons. The diatoms are single-celled organisms and typically 50 to 150 microns in size. Tens of thousands of diatoms varieties are known. At the Basalt mine, the three most prevalent varieties are; Melosira, Stephanodiscus, Eunotia. (Freshwater lakes have a limited number of diatoms growths whereas the marine deposits have thousand). Basalt diatomite is extracted by open-pit mining. The overlying waste material is ripped with a bulldozer, and then scrapers haul the waste to adjacent disposal areas. Once the diatomite bed is uncovered and qualified, the ore is then lifted with scrapers and hauled to corresponding stockpiles near the plant. Mining of diatomaceous earth requires the removal of large amounts of overburden material. This results in the development of large open pits. Whenever possible, old pits are refilled with overburden waste material. Topsoil from pit expansion is spread over areas that are being reclaimed. Once final grades are established, specially developed seed mixes are planted to help return the land to a stable form. The topography is contoured to control the rainwater flow into catch basins rather than simply allow it to run off the property. Processing of diatomaceous earth to meet customer specifications is as much of an art as it is a science. Most products at Basalt are manufactured to individual customer needs. Processing of the diatomite is done by one of two methods, depending upon the type of product to be produced. 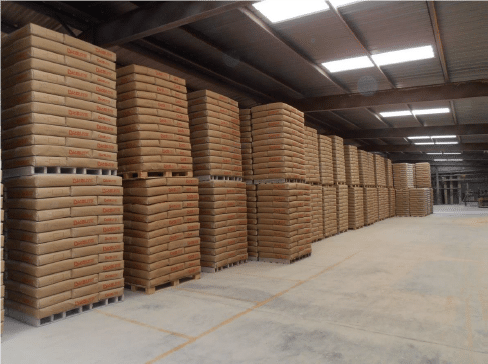 Two varieties of diatomaceous earth are made at Basalt – natural, calcined material. For further information on Dicalite Natural Diatomaceous Earth products please contact us below. Calcined and Natural Diatomaceous Earth samples are available upon request.